On Tuesday, 9/11/01, nearly 3,000 people were killed due to a terrorist attack. After the twin towers fell, millions suffered and are still suffering from psychological trauma due to this act of free will. Where was God in all of this? Some answer that there is no God. Others weaken God’s power or foreknowledge or love—saying that God couldn’t or wouldn’t stop the horrendous events. In the early 1700’s, people were influenced by two optimistic philosophical writers: the polemic poetry of Alexander Pope and the well-formed systematic writings of Gottfried Leibniz. Both held that God uses circumstances, even horrendous circumstances, for his greater purposes. Both believed that this world was this best possible world. 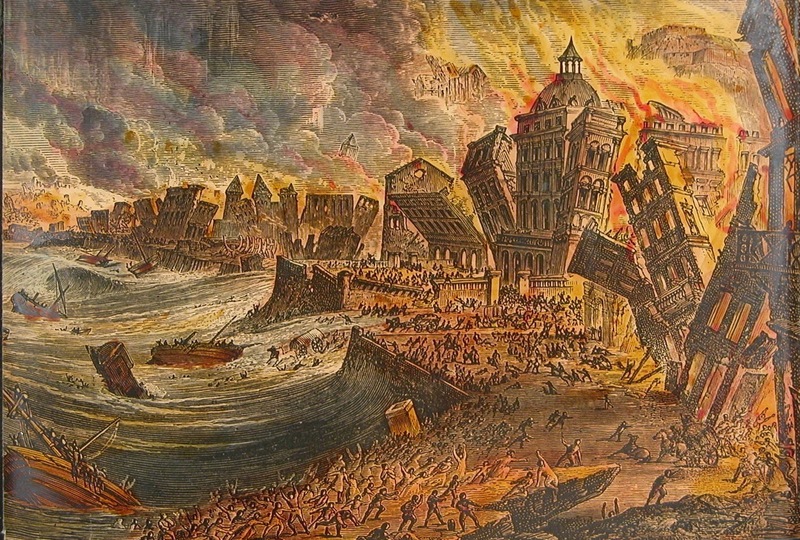 On Saturday morning, November 1, 1755 the views of Leibniz and Pope were tested as an earthquake of a magnitude of 8.5 rocked Lisbon Portugal. The earthquake was followed by fire and flooding. It is estimated that between 20,000-60,000 people died that day. It was “All Saints Day” and those that went to Catholic Mass were killed in town while those who were in the brothels on the outskirts of town survived. The event caused Voltaire to write the satire Candide (1759) in which he embraced skepticism about God. The horrendous event changed the peoples paradigm towards God. There is nothing contradictory or inconsistent about there being a God and there being evil. In the end, it is feasible to believe that God uses circumstantial “would have” statements. For example, it is true that if Morgan Stanley executive, Greer Epstein, did not take a smoke break at 8:40 am on 9/11/01, Epstein would have died as did his officemates. It is also true that if the computer would not have frozen when booking Flight 175, Elise O’Kane would have been on the flight and died. One fellow was just five minutes late to work at the World Trade Center and exclaimed that staying up late and “watching Monday Night Football saved my life.” Perhaps we will never know whether there was purpose in the pain of 9/11. One thing we do know is that it is true that horrendous evils reveal the property of heroism. That is, you don’t really know whether you are a hero or not until a tragedy happens. Second, horrendous evils are soul-making—they allow us to develop personally. Tragedy, often times, makes us grow. Be a victor and not a victim at work and in your personal lives. Last, in the Christian tradition, God participates wholly in suffering with and for people. May God’s presence and participation in your suffering and the suffering of others bring you confidence and peace. Good, but painful and hard perspective. Thanks for this, Craig. As a guy who has seen a lot more of the world than me, I appreciate your well-rounded view.